For the Tamimis of Nabi Saleh, their activism and their supposedly “non-violent resistance” is a family affair. This was not only illustrated in the fawning tribute to the Tamimi clan featured as a New York Times Magazine cover story in March 2013, but it is also reflected in many other reports, and Bassem Tamimi himself as well as his supporters have often emphasized the important role of his family. Indeed, for Bassem Tamimi – who has Amnesty International’s unwavering support – it is the Palestinians’ “destiny” to “resist”, it is an integral part of Palestinian “culture” and “history.” While Bassem Tamimi is hailed by Amnesty as a “human rights activist” worthy of unquestioning support, he has consistently emphasized that he regards all forms of “resistance” as legitimate, and he has frequently explained that his own (current) preference for protests and rock-throwing is a choice prompted by purely pragmatic considerations. It is time to spell out that Amnesty International is working on behalf of people who share and promote Ahlam Tamini’s vile ideology and her continuing incitement to and glorification of terrorism. Each stage has its special form of resistance, and the signs of this stage have clearly appeared in the method of the individual operations. They are planned by individuals, financed by individuals, prepared by individuals, and carried out by individuals. The result is the 100% success of the mission. Do not wait for an organization to organize you [or: put you into formations / register you / put limitations on you], set the time for you, command you [give you orders] and politicize you. 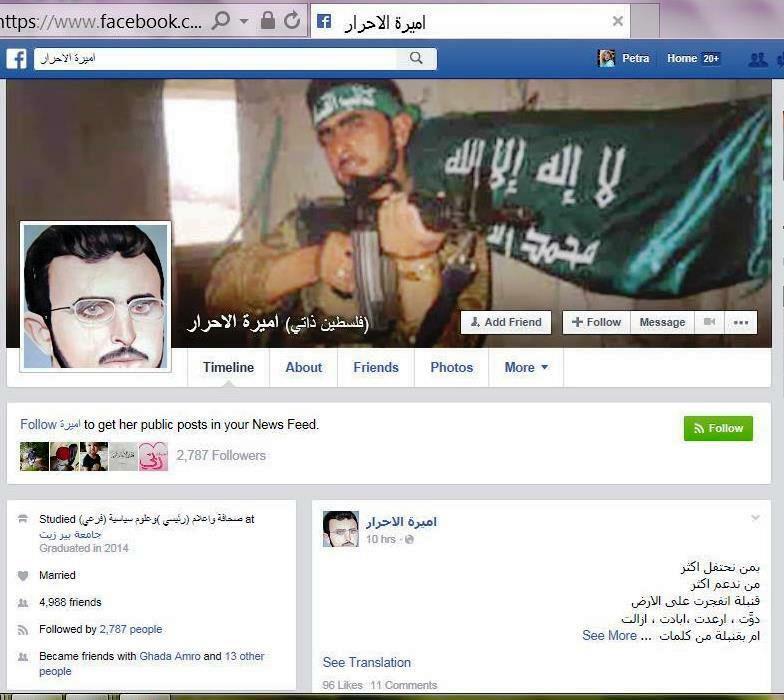 Nariman Tamimi shared this open incitement to commit terrorist attacks from a FB page belonging to a person who calls herself “Princess of the Free.” Both the profile picture and the cover picture displayed at the time of this writing show Izz al-Din Shuheil al-Masri, the terrorist who exploded himself in the crowded Sbarro restaurant in Jerusalem on August 9, 2001, killing 15 civilians , including 7 children and a pregnant woman, and wounding some 130 other people. As you can see, the “Princess of the Free” is quite popular: at the time of this writing, she has 4,988 friends and her posts are followed by 2,787 people. Among her FB friends are Bassem Tamimi as well as his wife Nariman and his famous daughter Ahed. 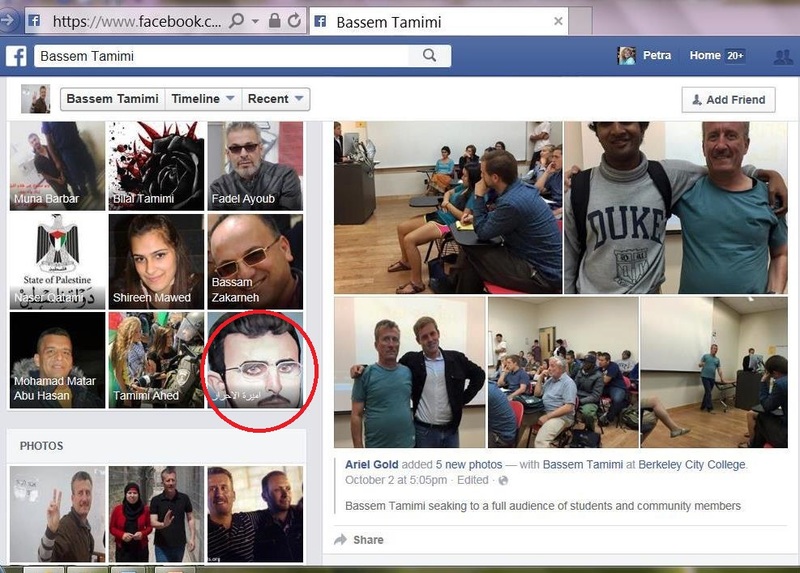 This screenshot from Bassem Tamimi’s FB page coincidentally shows among his FB friends the profile picture of the “Princess of the Free” (marked with a red circle) just above a photo Bassem Tamimi posted showing himself and his nephew Nizar Tamimi, a son of a sister of Bassem Tamimi who was convicted of the 1993 murder of Chaim Mizrachi and who was released in the 2011 Shalit deal. Another Tamimi clan member released in this deal was of course the Sbarro massacre mastermind Ahlam Tamimi – and Nizar and Ahlam had been sweethearts of sorts for a while, and got married shortly after their release. 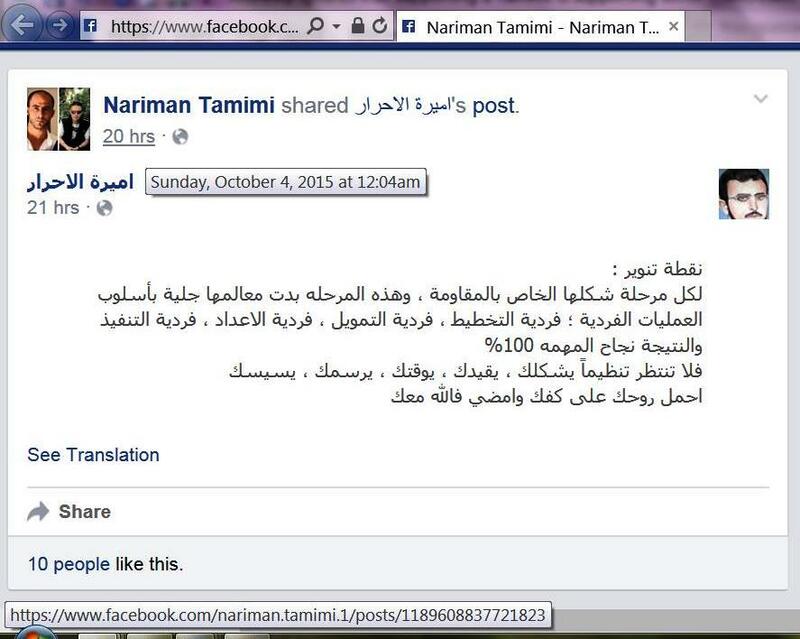 According to this FB post, Nizar Tamimi is the husband of the “Princess of the Free” – which would make the “Princess of the Free” Ahlam Tamimi. What prevents honor from returning? What prevents the rebels from laughing? 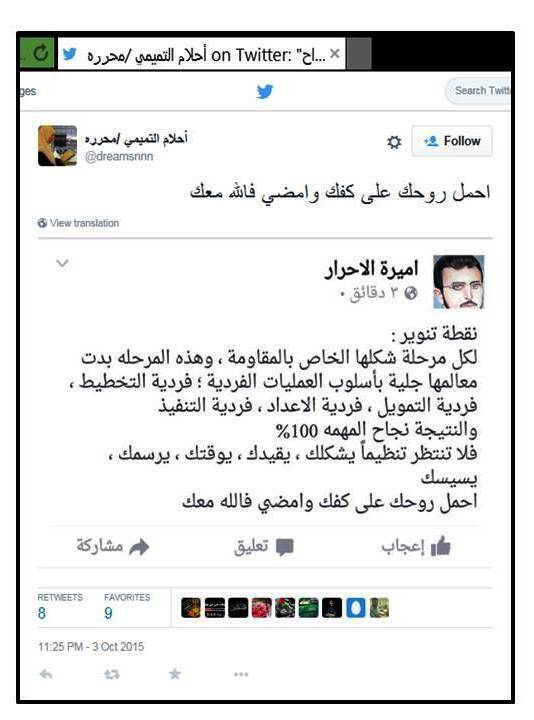 Irrespective of the question if the “Princess of the Free” is really the Sbarro massacre mastermind Ahlam Tamimi, the fact that Bassem and Nariman Tamimi as well as their daughter Ahed are FB “friends” of this terror-loving “princess” and the fact that Nariman Tamimi obviously follows the page and recently shared a post inciting more terror attacks is further evidence that the Tamimis of Nabi Saleh are not even trying to conceal their support for terrorism. That leaves only Amnesty International trying to conceal that their support of the Tamimis and Nabi Saleh is support for murderous Jew-hatred and terrorism. The incitement to terror attacks shared by Nariman Tamimi was also spread on Twitter by an account that seems to belong to Ahlam Tamimi or a collaborator. 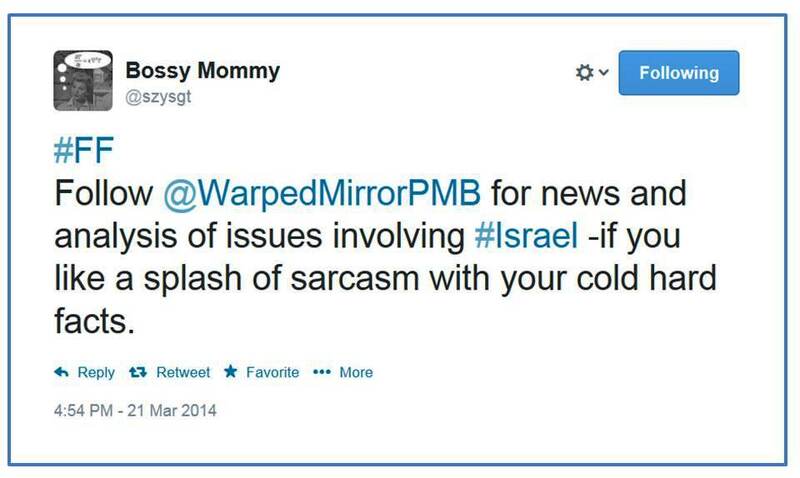 This entry was posted in Uncategorized and tagged Amnesty International, Tamimi, terrorism. Bookmark the permalink. Last month Nariman Tamimi the wife of Bassem Tamimi was asked in an interview about her relative Ahlam Tamimi. Tamimi was the terrorist behind Sbarro suicide bombing that murdered 15 Israeli civilians including 7 children. She replied. What she did was part of the resistance and I support every single method of resistance.